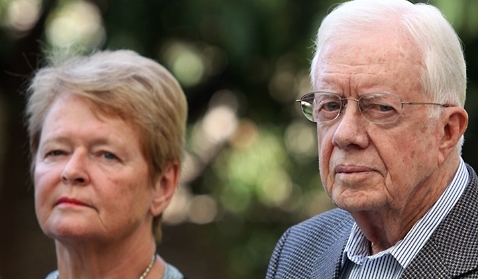 ← Why Was Carter’s Gaza Meeting Cancelled? 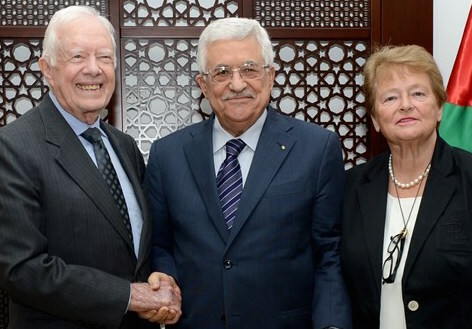 Former President of the United States Jimmy Carter and Gro Harlem Brundtland, former Prime Minister of Norway, concluded their trip to Israel and Palestine with a statement calling for “meaningful steps to stop the humanitarian crisis in Gaza and reconcile the different Palestinian factions”. Jim, thank you. You are my prime source of news and analysis, objectively and promptly delivered, relative to the Holy Land. What a sorry-tragic situation that I must write so while the MSM “Fourth Estate” is a despicable appendage of a foreign power. In May 1967 the U.S. Supreme court (in the Beyes Afroyim case) allowed dual U.S./Israeli citizenship. Since then, Israeli “Americans” have assumed high positions in our government, press, corporations, courts, police (who are now trained in Israel! ), etc. There has been a hidden coup in the U.S., which is now “occupied territory”. Have always admired Jimmy Carter. I went to Plains, GA the evening he was elected, along with all the networks and the crowd gathered at the depot…we are cousins via the Marcus clan.President Carter is remarkable at 90. He is so self giving. Thank you, Jim, for continuing to expose Israel’s horrendous stranglehold on Gaza and the rest of Palestine. Representing The Elders, former President Jimmy Carter and Gro Brundtland, former Norwegian Prime Minister, are genuine, honorable leaders who have the amazing determination and unstoppable passion to help the underdog, in this case, the beleaguered people of Gaza and all of Palestine. Meantime, Israeli arrogance has reached a new climax of chutzpah, as it snubs the US current and former Presidents, even though it has its begging hand out for many more Billions of Dollars, plus the most sophisticated (US) weapons systems from its benefactor, the world’s supposedly “Only” Superpower. All that, while no US or Western leader dares question Israel’s arsenal of WMD’s. The courage of The Elders certainly offers a dramatic contrast with the cowardice of leaders of the Western World. Of all the commentators on issues affecting Israel and Palestine, I have come to rely on Jim Wall’s research and insights. Obviously, his contacts in the Middle East as elsewhere are extensive, valuable, and generally reliable. With Jim, I am eager to know why two distinguished world leaders were denied access to Gaza. It has now been several years since I have been in that densely overcrowded area, but the photos and information that have seeped out reveal a truly devastating situation where thousands of human beings are confined against their will and at no fault of their own. The area festers and is just below the boiling point. The circumstances in many parts of the West Bank are tragic as well. The world, with the insights and experience of The Elders, must insist on a free flow of information and essential goods and the opportunities for self government. International bodies, including the UN and its agencies, need to encourage Palestinian unity and a two state solution based on internationally acceptable borders. I tire of this charade, and it is time someone began calling these shenanigans, what it is. With due respect to “The Global Elders” I am rather dismayed to put it lightly, by their recent trip to the “Occupied Territories,” primarily for their cowardly and limp-willed lack of forcefulness with Israel. All fine rhetoric, the same kind of nicey-nicey talk we have been hearing, over and over again for sixty years now. Of course, such a peace will be neither just nor lasting, but will be in violation of international law to the effect that all refugees have the right to return to their homes. It’s not that a two-state solution cannot technically also permit the right of all Palestinian refugees and their families to their original homes in Palestine; it’s just that to do so would render a two-state solution superfluous. Thank you for this full account of the Elders’ visit, Jim. I note that Israel allowed some construction material into Gaza yesterday, I believe. Coincidence? That’s doubtful. It is truly unfortunate that they did not enter Gaza. Seeing, smelling, sensing is altogether more powerful than hearing, as I discovered on my recent visit there. Indeed, in my telling of the story, many experienced Gaza watchers are shocked, yet know that it is a cheap substitute for first-hand experience. Bob Stiver offered the issue that Americans must be aware, the dual Israel/American citizenship and the inroads of these people into our American government not only federal but state. This is our challenge, to stop this over taking of America by Zionist. Remove the “cancer”!